I thought it was Seurat but it's actually "La Couseuse" by Theo van Rysselberghe. The other day I was looking for audiobooks set in other countries that I could download for the European Reading Challenge, and I came across one of my all-time favorites, The Enchanted April by Elizabeth von Arnim. 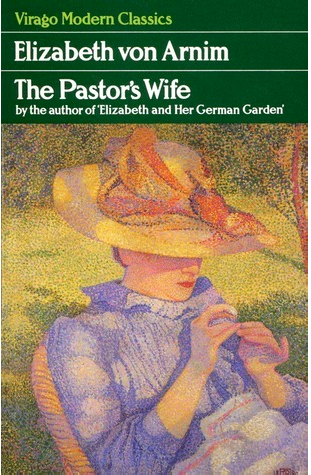 I definitely want to read it again (or listen) but it occurred to me that Elizabeth von Arnim spent much of her life in Germany and set many of her books there, and that I could choose one of those toward both the European Reading Challenge. Also, many of them are available for free digital download -- another win-win! 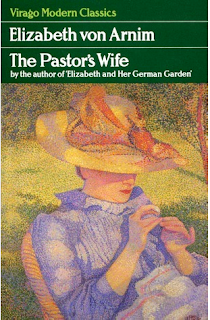 I downloaded three or four of her books, and randomly chose The Pastor's Wife, published in 1914. Here's the setup: young Ingeborg Bullivant, aged 22, is alone in London, sent by her family to visit the dentist. Her father, a rather overbearing bishop, has given her ten pounds and insisted she has a bad tooth dealt with; Ingeborg has been miserable for days and unable to help her father. Though taken for granted at home, she is an indispensable, unpaid secretary for her father, chaperone for her beautiful young sister, and basically does everything for her mother, who doesn't seem to get up off the couch much. The dentist solves Ingeborg's problem at once and all of a sudden she's alone in London (supposedly chaperoned by an aunt) with 10 pounds burning a hole in her pocket. On a whim, she signs up for a week's vacation tour to Lucerne, Switzerland, where she meets Robert Dremmel, the pastor of a rural German church. He promptly falls in love with her and after an unconventional proposal, they are engaged -- honestly, I think she's just too polite to turn him down. To the dismay of her family, she marries this unsuitable German and leaves home, where her new husband benignly ignores her and is obsessed with improving the soil for the local farmers. She really only gets his attention when she's producing babies. After several years of this stifling life, Ingeborg meets a visiting artist who is quite taken with her and tries to tempt her into running away with him to Italy. I really enjoyed this book but parts of it were much darker than I expected. Some of the situations are quite funny and others are incredibly heartbreaking. All the men in Ingeborg's life take her for granted and assume they know what's best for her -- they think of Ingeborg only as how she can be useful to them, and not one iota of what she wants and needs. Von Arnim also had quite a bit to say about women and pregnancies in the Edwardian era -- there's a lot of discussion about procreation that I wasn't expecting. I would not be surprised if it wasn't rather shocking for the time period (much like my previous read, The Wreath by Sigrid Undset). One thing I didn't like about this book was how naive Ingeborg was. I realize that she had a very sheltered upbringing as a bishop's daughter, and was then stuck in a small town as a pastor's wife, but she read books and newspapers, and would had some idea about the morals of the time. And the way the men in this book treated Ingeborg made me want to throw the book across the room. I've now read three of Von Arnim's works of fiction, and I've noticed a recurring theme of women who are breaking the boundaries of conventions. In Love, the main character shocks everyone by having a love affair with a man young enough to be her son; in The Enchanted April, the four women break free and go off by themselves to rent an Italian villa for a month (not so shocking, really, but pretty gutsy for the time). Elizabeth Von Arnim was actually married to a German aristocrat and had a rather unhappy marriage. I don't know many details of her life but I do know some of her early works are semi-autobiographical and I wouldn't be surprised if Herr Dremmel was loosely based on her own husband. I'm counting this as my German read for the European Reading Challenge. The cover art of this edition is just beautiful -- anyone know the name of the painting? In the past couple of years, I've been quite fascinated with Scandinavia -- a co-worker at the library got me hooked on Scandinavian TV series (I started with Bron/Broen, then quickly moved on to Borgen and Arvingerne). Watching these great dramas has inspired me to read more Scandinavian literature, so I chose a Norwegian classic for the Back to the Classics Challenge. In 1920, Sigrid Undset published the first novel in the Kristin Lavransdatter series, Volume I: The Wreath. Set in Norway during the Middle Ages, about 1300, The Wreath is the story of a young woman's coming of age. Though she wrote contemporary books as well, Undset won the Nobel Prize for literature in 1928 primarily for this trilogy. I'm always looking for interesting books in translation, and Nobel prize winner made this a win-win selection for me. The story starts out with Kristin as a young girl and oldest surviving child of her father Lavrans (hence her surname, Lavransdatter, which literally means Lavran's daughter; at that time, Norwegians used the patronymic naming system which is still in use in Iceland today). Kristin's parents have lost three young sons, so she is the great hope of the family. They assume she will marry well and when she is fifteen, she is betrothed to Simon, the son of a neighboring landowner. After a tragedy, she is sent to a convent school for a year, where she falls in love with the dark and dangerous Erlend, a handsome man with a bad reputation. The majority of the book is about Kristin's struggles between following her heart and disappointing her parents or pleasing everyone by marrying a man she doesn't love. Kristin also struggles with the moral implications of Erlend's past and her involvement with him. She's been raised as a devout Catholic and often turns to the priests for moral guidance, which she doesn't always follow. 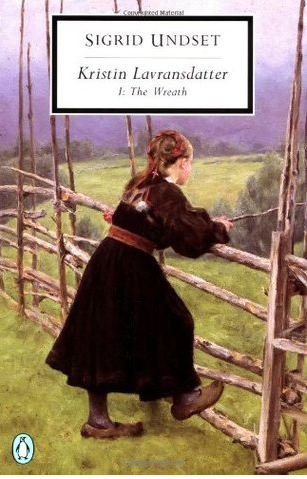 This book was written nearly a hundred years ago, and I was surprised at how frankly Undset wrote about some of the issues that Kristin was facing -- there's a lot of discussion about Kristin's virginity, children born out of wedlock, and even priests with illegitimate children. Undset was writing in the early 1920s when the role of women worldwide was really changing; I'll have to do more research but I'm pretty sure this book must have been quite controversial. I read the Penguin classics version which was newly translated in 2005, and I found it a very easy read. It did start a bit slowly in Kristin's childhood, but once she got betrothed to Simon, the plot really started moving and I finished it very quickly. I've always enjoyed historical fiction but I've read very few books set in the Medieval period. Undset did a lot of research and her descriptions of life in the period are excellent. Parts of it actually reminded me a bit of Game of Thrones, especially life in Winterfell (but without the dragons and White Walkers). I definitely want to read the next two books in the series, The Wife and The Cross. 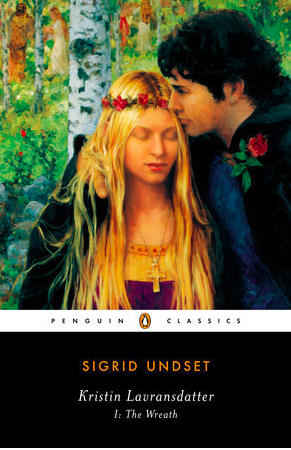 I really hadn't been planning on starting another book series (I still haven't finished the last two books in the Poldark series) but Undset really brought Kristin and her world to life. Luckily they're available as free digital downloads from my library so I may just zip right through them. I'm counting this as my Award-Winning Classic for the Back to the Classics Challenge and also as my Norwegian read for the European Reading Challenge. After my previous read for the Back to the Classics Challenge (a nonfiction memoir about life in a Russian gulag), I was in dire need of something fun to read. When the going gets tough, the tough need comfort reads! I'm not a big romance reader, but I've read a few of Georgette Heyer's Regency romances, and her books are fun, frothy light reads. Published in 1956, Sprig Muslin is a charmingly silly screwball comedy set in the Regency era. After his fiancee died in a tragic accident years before, Sir Gareth Ludlow put off marrying until his older brother dies, leaving him the heir apparent. On his way to make an offer of marriage to the quiet and steady Lady Hester Theale, he stops at an inn and encounters a young girl, Amanda, whom he soon realizes is running away from her family so she can elope with her young swain, an Army officer. Sir Gareth knows that she's out of her depth and needs protecting, but with completely noble intentions. He takes her along to Lady Theale's estate, where naturally her family assume young Amanda is his paramour. Naturally there are lots of mistaken intentions, escape attempts, and snarky comments about the fashionable Regency set. Of course all comes right in the end. Heyer's books are frequently recommended to fans of Jane Austen, and though the settings are in the same era, the similarities end there. Heyer is no Jane Austen, and after six or seven of her novels, I'm starting to see basic characters and situations repeating themselves -- the charmingly impetuous ingenue who is running away (often from an arranged marriage); a loyal young man who befriends the ingenue to get her out of a jam; a handsome, eligible bachelor (with a title, naturally) who saves the day; and a patient, quiet woman who ends up marrying the hero. Bits of it became a little tedious -- Amanda is really headstrong and spoiled, and she can't stop making up stories to convince people to help her -- and she gets away with everything because she's so pretty, which is truly annoying. That's not to say I didn't enjoy this book. 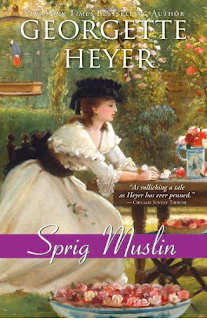 I don't know if it's the best book I've ever read by Heyer (so far I think The Grand Sophy and Sylvester are my favorites so far) but it was very enjoyable. I don't usually read romances but sometimes one needs a break from reality -- and I'd much rather read one of Heyer's comedies than yet another Jane Austen knockoff. Heyer wrote more than 40 historical novels, many of them set in the Regency era, and a dozen detective novels. They are usually funny and Heyer did extensive research into Regency history and society, so her descriptions and references to Regency life are very accurate. I also own a recent biography of Heyer that I found at the Half-Price Books last year and I'm hoping to get to that soon. Has anyone else read a good romance by Georgette Heyer? What romances are you reading for the Back to the Classics Challenge? I cannot believe that The Claverings is the 25TH BOOK I've read by Anthony Trollope! (24 novels so far, plus his Autobiography.) When I started reading Trollope back in 2008, I never imagined I would read and love so many of his novels. Granted, some are better than others, but there are only a few so far that I didn't love or really enjoy. And The Claverings is definitely near the top of the list -- it's been described as one of his best novels and sadly, I think it gets overlooked compared to the Barsetshire and Palliser novels, and his more famous stand-alone novels like The Way We Live Now (The Claverings has a mere 361 ratings on Goodreads, compared to Barchester Towers which has more than 10,000!). 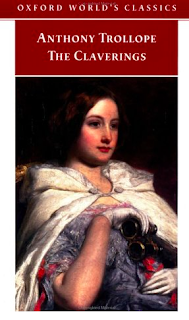 But it is a nearly perfect novel -- a great love triangle, some villainous characters, a couple of angelic young women in need of husbands, comic relief -- it has everything wonderful and comforting I have come to expect in a Trollope novel. But I suppose I should give some information about the plot. At the beginning of the novel, Harry Clavering is a young man from the poorer branch of a titled family (his father was the second son of the aristocratic Clavering family; his uncle has died and his cousin, Hugh, is Lord Clavering, head of the family. Harry's father, like so many second sons, joined the clergy and holds the living at rectory). Harry is in love with his cousin Hugh's sister-in-law, the beautiful Julia Brabizon. But there's no money, so Julia marries an older rich man, Lord Onger, instead, breaking Harry's heart. About a year later, Harry has decided he doesn't want to follow in his father's footsteps in the clergy and decides to become an engineer instead. He joins a family business and falls in love with the youngest and brightest daughter, Florence. She's not a great beauty like Julia but is bright, steadfast and true and will make Harry very happy, and they become engaged. Harry would like to get married soon but Florence puts him off until they can afford it. . . aaand there's trouble in paradise, because Lady Julia Onger is back in the picture as a beautiful, wealthy widow whose abusive and alcoholic husband has luckily died quickly, though not before stirring up trouble with Julia's reputation. Now Harry faces a quandary -- should he throw over the charming and faithful Florence for the love of his life? Does Julia still have feelings for him, as well as her 7000 pounds and a life interest Onger Park, her late husband's estate? This is classic Trollope, and I enjoyed every minute of it. Florence is sweet but not saccharine and pointless like so many Victorian ingenues; Harry's sister also has a doomed love affair with a poor curate; and there's comic relief with Lord Hugh's feckless younger brother Archie who'd love to get his hands on Julia's fortune. There's also a sleazy European Count Pateroff who's wooing Julia, and his shady sister Sophie who pretends to be Julia's best friend. Even though the ending was predictable, I loved this book. It's one of his domestic novels, so no politics like the Pallisers novels, which might put some people off; and though Harry's father is a vicar, there's not a lot of religious hierarchy which I sometimes find confusing. This would be a great introduction for someone who wants to try Trollope but doesn't want to start a six-book series, or someone who's daunted by a whopping 800-page triple-decker like The Way We Live Now. Bloggers, have any of you read The Claverings? And what are your favorite Trollope novels? Our library has a cart in the vestibule where people can leave books and take books whenever they want, and I've found some real treasures. Last summer I found a copy of Journey Into the Whirlwind by Eugenia Ginzburg, which I recognized as a recent Persephone reprint (though not a beautiful Persephone copy, sadly). It probably would have lingered on the shelves for years but it came back on my radar when I saw it listed on David Bowie's top 100 book list. I also realized it would fit the Russian classic category in my own challenge. 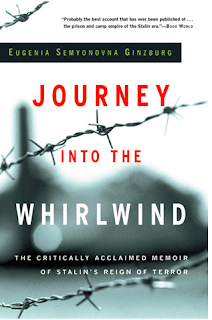 I was a little apprehensive to read this book because a memoir about Stalin's reign of terror doesn't sound like the most cheerful of reads, especially during a dreary winter. However, I do love memoirs and survival stories, and this is both. Ginzburg was 30 years old in 1937, a teacher and active Communist Party member. After a co-worker at her university was arrested, Ginzburg was hauled in for questioning and ordered to denounce him. After she refused, she was arrested herself on trumped-up charges and accused of being a Trotskyist. What follows is a Kafka-esque downward spiral that is so ridiculous and frightening it's almost hard for me to believe, having been raised in a democracy where anyone who's watched a TV police drama understands Miranda rights. After a seven-minute trial, Ginzburg was sentenced to 10 years in prison. The book covers the first three years of this nightmare, including two years in prison under terrible conditions, an excruciating journey across the continent to Vladivostok (jammed in a train car with more than 70 other women, with no bathroom and very little water); a boat journey that sounds reminiscent of a slave ship; and finally, a work camp where the already weak prisoners were forced to cut down trees and hack at the frozen ground while underfed and under dressed in the frigid weather. It was like the nine circles of hell, and it doesn't seem like things can get any worse for her -- until they do. This book was just horrifying, yet fascinating. If I hadn't known it were non-fiction I probably would have returned the book to the donation cart, but I couldn't stop reading. Ginzburg was determine to stay alive just to spite her captors. And though there was cruelty, it was inspiring to read how the prisoners tried to help one another, often in tiny but meaningful ways like sharing a sip of water or a hoarded sugar cube. Even the prison staff sometimes showed humanity and kindness which led her to survive. Somehow, she managed to survive a total of 18 years in the Soviet gulags. We were still living in that bitter-sweet world of feeling which our prison life in Yaroslavl had created for us. I felt instinctively that as long as I could be stirred to emotion by the sea breeze, by the brilliance of the stars, and by poetry, I would still be alive, however much my legs might tremble and my back bend under the load of burning stones. It was by preserving all these treasures in our minds that we should resist the onslaught of the horrors around us. This was a difficult read because of the subject matter -- I could only read a few chapters at a time before I had to put the book down and read something else. But it is well worth reading as a story of survival and hope. I'm counting this as my Russian Classic for the Back to the Classics Challenge and also for the European Reading Challenge.